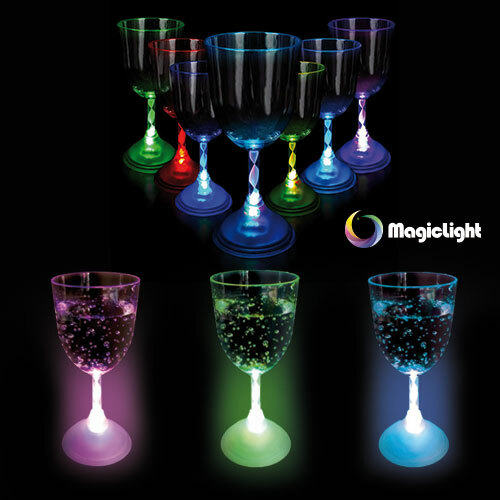 Brighten your special occasions with this accessory, the led light up flashing wine glass. Your guests will be charmed during a evening party, Christmas party, wedding reception, in bars and restaurants. This bright acrylic light up wine glass is 8 oz and measures 7 inches high x 3 1/4 inches in diameter . The stem is 3 inches. This light up wine glass is made of strong acrylic and has 3 AG13 batteries included and replaceable. You simply have to press the button underneath the foot of the glass to select the desired configuration. You can choose the color blue, green or red. You can also choose the option of alternating colors. This wine glass is wonderful for an adult audience. Multicolor light up champagne flute - 3 AG13 batteries inc. & repl.